Saragli is basically a type of syrupy sweet that resembles baklava. The phyllo is rolled in a long tube and then cut in pieces and baked. 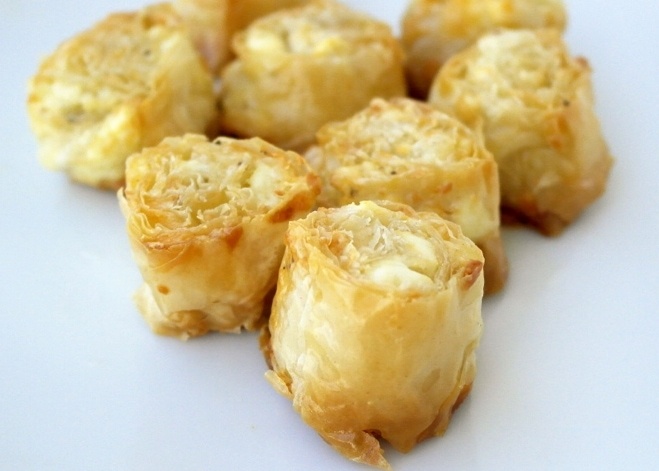 Obviously this is not baklava but a savory version, called cheese saragli. I first noticed them when my brother’s mother in law made them for parties and get-togethers. They were really tasty, they looked nice and everybody liked them. 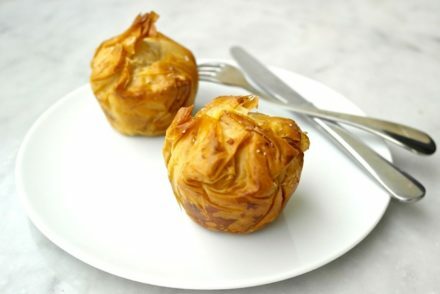 Crunchy phyllo with little chunks of feta and a bit of spiciness from the kefalograviera cheese (cheese used for saganaki), what’s not to like? She shared her recipe with me and here it is. It is basically like mini cheese pies, but without all the work. 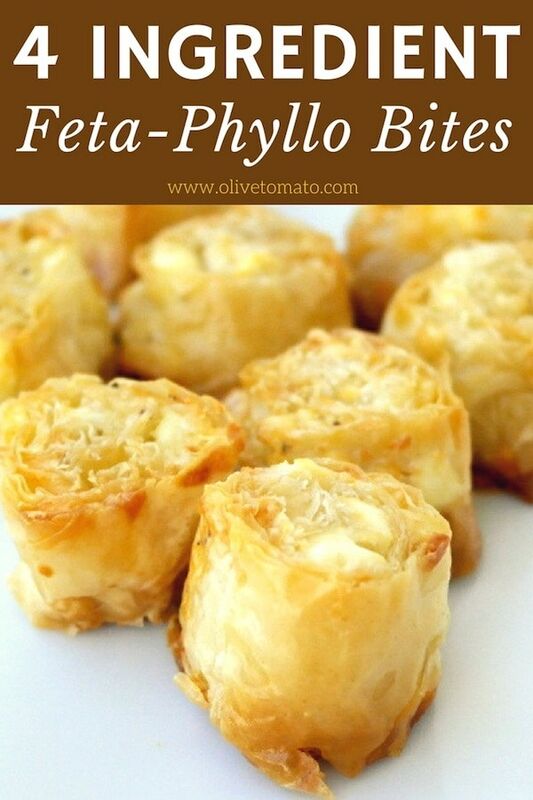 There are only 3 ingredients in this: phyllo, olive oil and cheese, plus you freeze it and bake off as needed. These little morsels are satisfying as a small appetizer, 2-3 pieces per person would suffice, and at 45 calories that’s pretty good. I reduced the kefalograviera a bit from the original recipe for less saltiness. You could also serve these as a side dish for dinner. Mix the cheeses in a bowl, add some pepper. Place a phyllo sheet on your working surface. Brush with olive oil and sprinkle cheese on the sheet. Place another phyllo sheet and repeat the whole process (olive oil, cheese) 2 more times. Now roll starting from the long side tightly like a cigar, until you have a long tube like a log. After it is rolled, push the ends in so it scrunches a bit. Wrap in plastic wrap and place in the freezer for at least an hour (or for several days) so it hardens. Continue this with all the phyllo sheets. You should have a total of 4 long logs. When ready to bake, preheat oven at 350 Fahrenheit (175 Celsius), take out the rolls, and let them sit for 10 minutes. Cut them in 1 inch slices, place them on a greased pan with cut sides up and down. Bake them for about 20-30 minutes until golden. These can be served or warm or in room temperature. Hey! 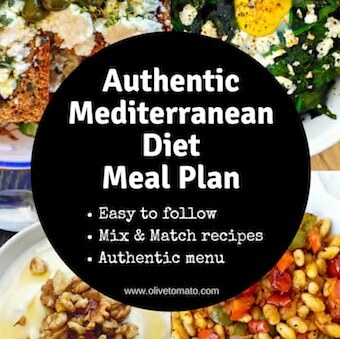 Thanks for the wonderful recipes! 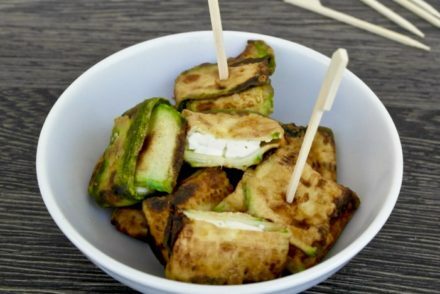 I made these last weekend for an appetizer for a party, and they were so so so good. Not a single one was left. I didn’t have enough cheese filling to do a fourth roll, so I just put a bit extra in my third one. Next time I will increase the quantity of cheeses. Thanks again, I love this little treasure trove website. where would i find kefalograviera? at any grocery store? thanks, can’t wait to make these. Hi James, I would say #4, the all-purpose phyllo. If unable to get kefalograviera, should you use 21 oz. 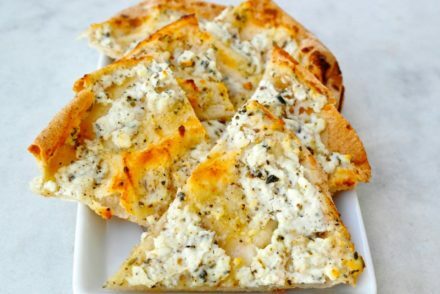 of feta?